In 2012, Deborah Needleman, then the editor of T magazine, approached the artist Konstantin Kakanias for a special commission to illustrate the standout heels of the season, from the likes of Louis Vuitton, Giorgio Armani and Christian Dior. The sketch he delivered, called “The Cat’s Meow” — in which a black cat delicately paws past a lineup of black stiletto pumps, gazing at them with bemusement — perfectly embodied Kakanias’s playful view of the fashion world. So began a fruitful relationship between Kakanias and T, which produced what the artist calls a “kaleidoscope of drawings” numbering in the hundreds. Some 60 of these gouache, watercolor and pencil illustrations — often made in transit, at hotels and in friends’ homes, and then dispatched by post to the magazine — have now been gathered for a show, called “The Times,” which opens on July 21 at the Gavlak Gallery in Los Angeles. The work of the Greek-born, L.A.-based Kakanias has been a fixture in various sections of The New York Times since 1989. His most famous sketches depict his imaginary alter ego, a bouffant-haired, aquiline-nosed doyenne named Mrs. Tependris, as she flits about fashion shows offering up amusing observations and bons mots. At T, where he served as a contributing editor for five years, Kakanias has been tasked with illustrating everything from a simple handbag to imaginary scenarios inside famed establishments. 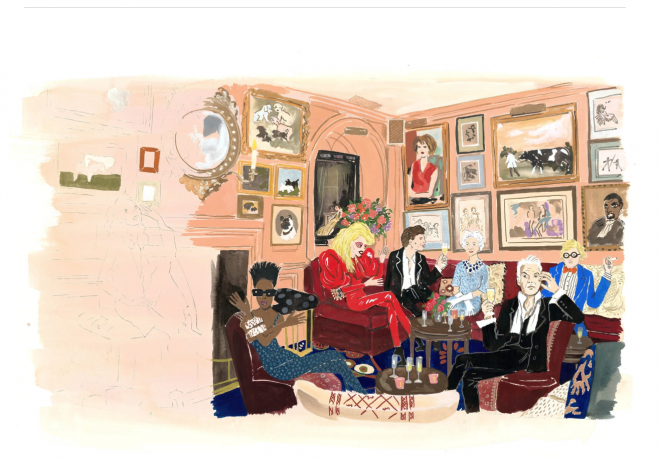 In one such mise-en-scène (pictured above), David Hockney, Grace Jones and Lady Gaga hobnob with Queen Elizabeth II inside the legendary London nightclub Annabel’s, an image that made the magazine’s cover.